A special action concerning personal jurisdiction over a trustee. Wells Fargo Bank took judgment against Hoag. It then served subpoenas for financial records in aid of garnishment. Among the targets were three charitable remainder trusts of which Hoag was settlor, recipient of regular payments, and trustee. In response Hoag resigned as trustee and appointed in his place a corporation in the Bahamas, which refused to comply with the subpoenas. The bank then brought the present suit against Hoag, the trusts, and the Bahamanian trustee alleging that “Hoag had fraudulently concealed his assets by transferring them to the [trusts]” (no doubt the bank’s Complaint was more coherent than this description makes it sound). The trustee moved to dismiss for lack of personal jurisdiction; the trial court denied the motion; on this special action the Court of Appeals reverses. 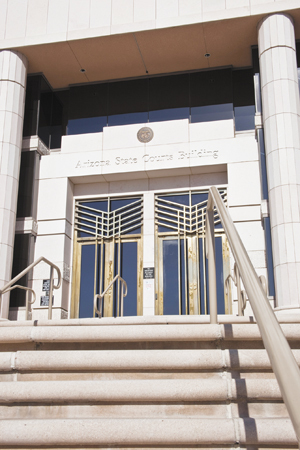 Under 14-10202 a trustee can become subject to jurisdiction by “accepting the trusteeship of a trust having its principal place of administration” in Arizona. The bank argued that since Hoag administered the trusts here the new trustee was subject to jurisdiction here. But the court says that since the statute says “having,” which “refers to present action,” not “had,” it refers to where the trust is “currently being administered.” At the time of the lawsuit the trustee was administering the trusts in the Bahamas so the statute doesn’t apply. Apparently, then, “having” refers not to the time of the trusteeship’s acceptance but to some future time when an action is brought. We would have thought that “accepting” and “having” refer to the same time but it seems that’s just us. The court explains in a footnote that there is a difference between present and past participles; though unintended, we hope that’s an insult rather than a help to its readers. 14-10202 by its terms “does not preclude other methods of obtaining jurisdiction” and the trial court decided that it also had jurisdiction under Rule 4.2. So the opinion makes a constitutional analysis. As is seemingly the court’s standard practice nowadays, the discussion consists for the most part of lengthy explanations of elementary principles including citations of most of the jurisdiction cases you’ve ever heard of all the way back to Pennoyer v. Neff. The bottom line is that under these facts the trustee didn’t have minimum contacts. The bank seems to have argued that the trustee communicated with Hoag and sent him various things but the opinion decides that these were responses to Hoag’s acts, not acts purposefully availing the trustee of jurisdiction here. The court remands with directions to dismiss as to the trustee. It agrees that the transfers look fishy but says the bank didn’t argue for jurisdictional purposes that the trustee intentionally abetted the hiding of assets.